Take a peek at our Pinterest page for ideas separated by easy to use colors and categories! 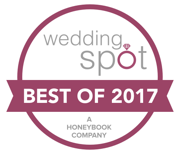 Welcome to The Rock Weddings, Receptions, and Large Scale Events webpage and thank you for choosing to spend a few moments reviewing information pertaining to hosting your event at The Rock. I can honestly say that weddings and receptions are our passion and we strive to create beautiful, elegant, and unique events for our clients. The smile that crosses a bride's face as she walks into the lodge and sees it set up for her reception for the first time, is absolutely priceless. The joy on a grooms face as he sees his bride walking towards him never gets old. Watching the father-daughter or mother-son dance always brings tears to our eyes. These are the moments that make all of the planning pay off. These are the moments that move us to continue creating one of the best venues in Wisconsin. At The Rock, it is our goal to make your wedding, reception or large scale event one of the most memorable days of your life. We believe that guests of all ages should be entertained, involved and refreshed! These elegant, fun, and inexpensive touches will make your wedding day stand out as a memorable night they will take home with them and think kindly of in the months following your event. Refresh your senses by opting into one of our delicious Flavored Waters and Lemonade or Sangria Bars. A delightful, simplistic touch that makes a stylish statement and is sure to be remembered by all of your guests! Choose from such flavors as Rosemary or Lavender Water, Raspberry Peach or Mint and Rosemary with Vanilla Lemonades, and White Peach or Caramel Apple Sangria; as well as many other varieties. Rent our Lawn Games or host a S'mores bar to provide fun for guests of all ages! From Giant Jenga, Giant Connect Four, Bags, Giant Chess, Giant Checkers, and Giant Tic Tac Toe; you have your choice of games that are sure to bring loads of fun to guests of all ages! Another fun option: step outside of the box and enjoy a trendy S'more's Bar!! Set up just for you, our S'mores are sure to delight all of you and all of your guests. Enjoy our spacious patio, pull up a chair and enjoy the wonderful breeze brush against your skin as you create a classic Wisconsin favorite around our over-sized luxury gas fire pit. With scenic views for miles, its just the perfect treat for the perfect night! Our goal at The Rock is to make all of our clients feel as though they are the only client for the entire season, even though we are frequently booked to capacity each year. Details, details, details...that's what we focus on at The Rock. We want this to be the best day of your life (to date) and to make that happen, we have specific planning sessions highlighting information that you will need to know as you delve into bringing your magical day to life! By providing pictures; ideas; rental quotes for linens, tables, chairs, ect; and sharing our expertise, we aspire to make your planning stress free as we build a relationship with you that will last a lifetime! Make your reception memorable for your guests by opting into one of our affordable Open Bar packages or by purchasing a Champagne Toast! Choose from 2 hours of open bar for cocktail hour (including unlimited tap beer all evening) or surprise your guests by hosting an open bar all night long! Our prepaid packages ensure that you know exactly how much to budget before stepping inside our hall on your special day! Served in actual crystal champagne flutes, each glass of champagne adds just enough sparkle and elegance to be sure to impress your guests. Our champagne glasses are carefully re-washed and polished before each event to add the perfect gleam and decoration to your guest tables. Having a place for you and your guests to stay is important when booking a venue for most of our clients. Fortunately, The Rock is directly across the street from the brand new Hampton Inn, which we have a personal relationship with. Booking blocks of rooms easy, convenient, hassle-free and best of all at no up front cost to you! We will give you a direct link to the Director of Sales who will happily guide you as you prepare for your guests arrivals. Shuttles are also available for your guests if booked far enough in advance, see hotel for details. Whether you use our natural wooden tables on site or choose to rent round or square tables and linens from our outside vendor, the lodge is sure to compliment any style! From our wall of windows highlighting the picturesque view on top of the hill to the exposed wooden beams lining the ceiling, the lodge is absolutely breathtaking and sure to impress. From wildflowers to roses, whichever decor you choose to compliment The Lodge, this exquisite venue is one of the most beautiful in Wisconsin. Weddings at The Rock Snow Park Price List PDF. A shout out to Cream City Weddings and AKP Photography for these incredible photos of my clients! Go to their pages to learn more about their wedding photography packages!